How do you like Free? We have decided to make it even easier for our SpiraPlan and SpiraTeam customers to get started with TaraVault. 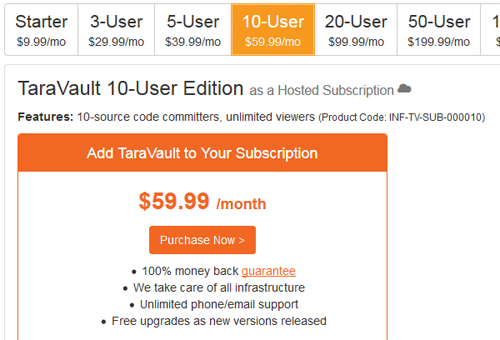 For a limited time, the 1-user TaraVault service is available for free to be added to your account. This allows you to have unlimited viewers and one committer. Now confirm the upgrade of your subscription (if you are an annual prepaid customer you will have to enter payment information, if you are a monthly subscription customer, it is simply added to your monthly charge). After about 30 minutes you will get an email letting you know that TaraVault has been provisioned and added to your instance. Now you need to actually activate it within SpiraPlan / SpiraTeam. You should see the ‘TaraVault’ menu entry under the “Integration” heading. If you don’t see this option then you might either be self-hosted or running SpiraTest. If you are running SpiraTest, please contact Inflectra customer services to get your account upgraded to SpiraTeam. This provides you information on the name and ID of your TaraVault account as well as an indication as to how many source code users your subscription allows. If you need to purchase additional users, just contact Inflectra customer services who will be happy to help you out. 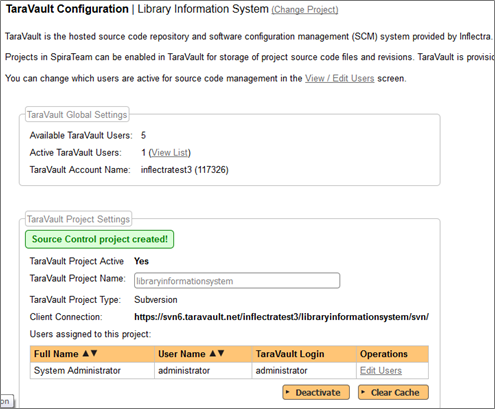 Once you have activated TaraVault for your instance of Spira, you can now begin to provision specific projects and assign users. Project Name – this is the name of the project in TaraVault. This name is incorporated into the connection URL so it should be alphanumeric only. Project Type – this is the type of SCM repository you wish to use. Currently the choices are between Subversion and Git. Note: once you choose the repository type for a project it cannot be changed without deleting the entire repository, so make sure you understand the differences between the two technologies beforehand. The system will then populate the ‘Client Connection’ section with the URL that you need to use to connect to this TaraVault project from your Subversion or Git client. In addition, it will display a list of users that are enabled for this project. 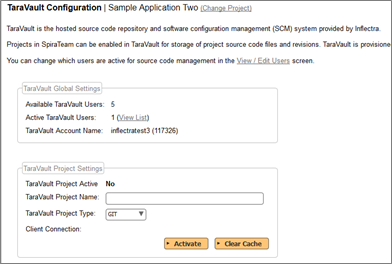 By default, the built-in system administrator account will be automatically enabled for TaraVault use and will be added as a member of all TaraVault projects. To enable other users to commit code/files to a TaraVault repository, you need to go to the Administration > Users > View/Edit Users menu item. Enter in the desired password for TaraVault and click the main ‘Update’ button and this user will now be added to TaraVault. Note that you need to have sufficient TaraVault licenses for all of the users you wish to activate. Now click on the ‘Add Projects’ link and you can now choose which TaraVault projects to add the user to. You should now click the ‘Add User to Project’ checkbox and then click the ‘Add’ button. The user will now be listed for that specific TaraVault project. You will see the two users listed under the current project. If you click on the ‘Edit Users’ hyperlink it will let you make changes to the user’s TaraVault settings. For example you may wish to deactivate a user to free up a TaraVault license for another user. This page displays the current user’s TaraVault login as well as the connection string they should use to connect to the current project (the format will depend on whether the user is using Git or Subversion). They can click on the ‘Click to show password’ option to reveal their password. This is necessary since they will need to know the password to use when connecting to Subversion / Git using their desired SCM client (e.g. TortoiseSVN, TortoiseGit, etc.). The complete user manual for TaraVault is available on our website. We have forums where you can browse best practices and other information.